...and has anyone bought/heard the album yet? I think it's his best album since Your Arsenal. While it might not have some of the stand-out tracks like Quarry did, Ringleaders feels a more complete album; sounding at times like a companion to Viva Hate, in its orchestrations and arrangements. Wow...I'm the only person who ever posts here anymore. I haven't been able to listen to all of the songs yet. I look forward to hearing it all and then posting my review as well! i am just not digging it. the arrangements, the songs themselves, the way he sings them. nothing. i dont know whats wrong with me. i used to love morrissey. favorite songs are Speedway, Jack The Ripper (live from M.E.B.Y. ), Why Don't You Find Out For Yourself, pretty much all of Vauxhaul & I and My Early Burglary Years. i even like a few songs off Maladjusted better than anything on the last two albums. i'll give it a few more tries to see if anything sticks. Anything sticking yet? Here's a thought (just a thought and not meant as a criticism but a guess as to an explanation): your taste seems to run to the more "indie" type stuff, which might encompass a lot of your Morrissey faves that you mentioned. But Morrissey's aspiration has never been to be indie, per se; he believes in the idea of the pop icon of worldwide renown who touches millions of people the world over. I think his aspiration is really to be some impossible combination of Johnny Rotten and Frank Sinatra. I think if you approach this album and the last one from that understanding, you'll be better able to appreciate what's going. Just a thought. If you don't like it, you don't like it. I've finally completed my little obsessive essay about the album. It somehow ended up involving a re-scrutinizing of David Lean's Summertime (the "something special" I mentioned before--hope I didn't oversell it!). It is posted here. I ask your advance forgiveness for the lack of any real vetting/copy-editing process for this. I cleaned it up as best I could with the amount of time/energy I have left. It was three weeks in the making, so I hope I've done the record at least some justice. One of the very few reviews/assessments of the man or the album to get it right (in my opinion) can be found on Slate. Morrissey has revealed that his search for his perfect final resting place may be over. Speaking to the Daily Record, the former Smiths frontman cited the celebrity cemetery Hollywood Forever in his former hometown of Los Angeles as his preferred graveyard. He declared, "I like Hollywood Forever. I've sat there for a very long time and felt quite good about it." The singer explained that he decided on the cemetery after visiting the grave of Ramones singer Joey Ramone. "I always felt I wanted nothing more than my name, birth date, death date, and all three names, Steven Patrick Morrissey," he said. "And I've even considered putting money down for reserving a spot." For now though the singer is still very much alive, and even played a show at the weekend near his preferred graveyard at the Hollywood Bowl. Sadly, no. Not really a fan of the Bowl and I had no one to go with anyway. I missed the Pasadena show too. 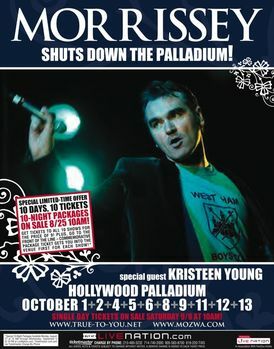 Morrissey today announced a 10-night stand at the Hollywood Palladium -- the final shows at the venue before it closes down for renovation. The dates are Oct. 1 through 13 (Moz takes three nights off during the run), and before you crack wise about the number of people (some you may even know) who will attend every show, know that promoters are offering a special deal for fans who want to attend every show. Starting at 10 a.m. Monday, package deals giving the Moz faithful 10 nights for the price of nine go on sale. The deal also gets attendees a commemorative ticket, the opportunity to go to the head of the queue and, presumably, much better odds of catching the man's shirt when he tosses it into the crowd near the end of the show. How much are the tickets? This just in: The special packages are $391.50. before the leviathan surcharges Ticketmaster is sure to add. That would put single-night tickets at about $43. So, are you gonna go, McG? If I can get a ticket. I'm sure it'll sell out fast. Ideally, I think I'd like to see Oct. 13's show. Got my ticket for Oct. 13th. If you're not seeing every show, you're not a real fan. How hard was it to get tix for the last night? Quick, then again, I was only buying one.